Javelina is always talking about Millennials: how they change the world, how they shift market demands, how they transform businesses by demanding they be held accountable, be productive entities within our communities and operate consciously within them. Millennials also become the leaders of our local governments and their choices represent and advocate for us, or else they don’t. Their superpower is social media and they are civically engaged: #StateCapitolSelfie. If you get as excited about Millennials holding down the State House as Javelina does, then you’re gonna love this. Four days before the midterm election, I met with State House Representative-Elect Andrés Cano, at Hanny’s in Downtown Phoenix. It was Pay Equity Day and he was on his way to support Latinas and I had just left a panel discussion comprised of Writers of Color discussing racial microaggressions, spoken word in academia and paradoxical positions they experience in the global literary community. I didn’t know what to expect from Andrés, but I didn’t think my conversation with him would come close to what I had just experienced. He floated to me on his own smile. Our greeting was a comfortable hug. He had suit burnout and was taking a jean day. He didn’t look at his phone while we spoke, which may not seem like a big deal, but to me, it’s a real human kindness. He is young and worked for Pima County since he was 14-years-old, starting with a summer internship in the Waste Water Department. He was raised by a single mom and helped pay the bills as a teenager. 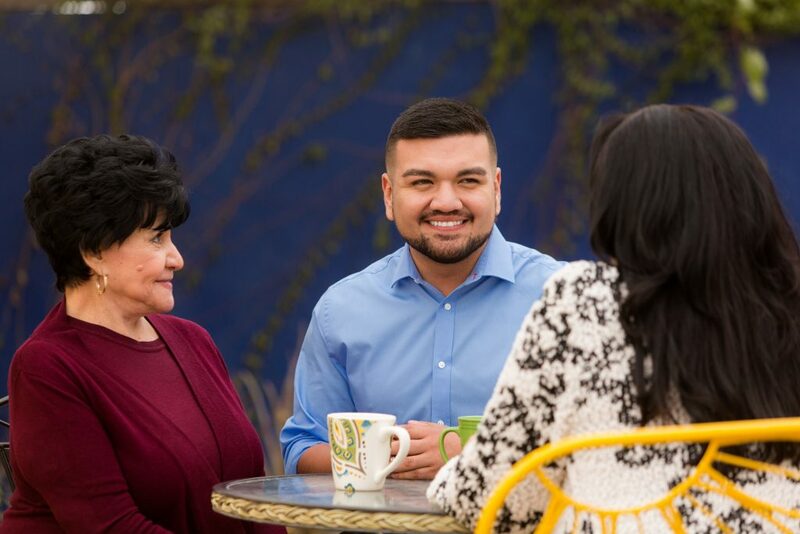 He has been on the same path for over a decade, ascending in position through hard work and continued relationships that led to his success as the youngest policy supervisor for Pima County at 20-years-old, 6 years ago. He loves listening to piano music on Sundays and reading the New York Times. His favorite book is “Call Me By Your Name,” because every time he read it as a teenager he cried over how beautiful the love was between the two characters. Connecting over this story made me trust him a little more because the love is so authentic and beautiful. He is a “Swifty.” He would like to be able to recreate himself without reprimand, like Taylor Swift, but understands the obvious ways in which politicians and celebrities differ in what they can and cannot do, unlike some POTUS I know. In the window of Hanny’s, he talked about the necessity of understanding the stories of undocumented people and people who are not politically involved. He wondered out loud about how he was going to help that happen. This part of our interaction felt promising and comforting. I didn’t think he would talk about undocumented people at all, honestly, because headlines were askew with absurdities about the caravan and military camps along the border. When Andrés was seven-years-old he was changing his Nana’s oxygen. She had an occupational lung disease she would later die from. This is one of many roots for his decision to run for office. Other roots are obvious causes that incur from him simply being who he is: Latinx and LGBTQ. We met during Dia de Los Muertos. “What will you do to honor your Nana?” I asked. His smile was a fish hook lifting one side of his mouth in thought until followed by the other half to memory. He was in some place with her for a moment. “I think I’ll just talk to her on the way home to Tucson tonight,” he said. The idea of talking to her led him back in time, to August 2018. It is Primary Election night. While it’s hot outside, the AC makes the room a cool 75 degrees. Andrés Cano is holding his mother’s hand tightly. As ballots are counted the percentages allocated to each of the three candidates are teeter-tottering back and forth between them. Only two of them will become the presumptive elected State Representatives for Arizona’s third district. Andrés feels a surge of love and memory for his Nana, who he felt close to in that moment, standing together with his mother. He knew he had to run. If he ran and won, he would be one person in the House who could show people like him, just by being there, that it was possible. Possible for Latinx men to be there. Possible for first-year college graduates to be there. Possible for LGBTQ people to be there. If he won, he’d also be taking a $24,000/year salary, plus he’d have to find a place to stay when in Phoenix while maintaining his space in Tucson. He wasn’t one of the three R’s he talked about during his campaign. He was not rich. He was not retired. He was not Republican. Regardless, it was still time. No other time would yield such promising results for the next generation watching. He wanted people to understand, “If there is struggle, then that struggle is shared, and we should find a way to lift folks up.” This is another definite strength of Millennials: their aisles are intersections now. The 9 Millennials we have in the house are the youngest group so far. He expects governance to differ in many ways from the campaign experience, but he is ready. He is unfamiliar with sitting idly by while the world demands change. If you scroll through Democratic Representative Andrés Cano’s Facebook page (not unless you have a while, because you’re going to fall into his smile and the smiles of everyone he stands with) you will see him making phone calls for January Contreras, showing solidarity with our trans brothers and sisters, supporting union workers, and challenging the “Man Box,” AKA toxic masculinity. Do you want to clone him, too? And, look, I know we all choose the version of ourselves we want to promote on the internet, but the fact is that he was there, at each event, for each group of people and for each cause, in solidarity and support. Echo: now is the time. Maybe the right reason is because the people voting in two years are kids like the Parkland Survivors. They were watching NODAPL. They saw #metoo. They’ve taken a knee on their own high school football fields and gotten kicked off before a game. Their families have been torn apart by ICE. They’ve witnessed the most ridiculous POTUS, probably ever. They’re voting because they’ve witnessed the institution fail in their classrooms, their streets, their communities and they know what’s possible because who they see leading already.